Bring height and drama to your favorite potted plant with the Esschert Design Round Plant Caddy. Placing your flower on a caddy or trivet quickly elevates it from the ground, providing more air circulation around the roots and better water drainage. 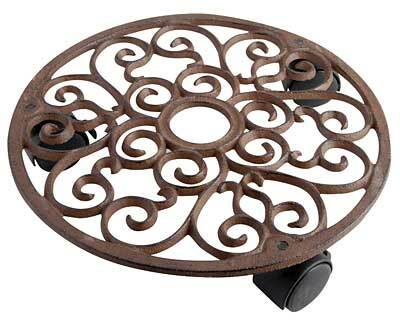 This circular unit adds a traditional look to your backyard or deck, enhanced by its aged brown color and cast iron construction. A scrolled pattern creates the base, for an elegant touch indoors or out. The item easily holds pots with a 10.5" or smaller base diameter, and the three attached plastic casters allow you to perfectly position your plant. Two of these casters lock into place, preventing unwanted movement. Display your favorite potted flower with help from this Round Plant Caddy. Capacity: up to 150 lbs. Esschert Design Square Plant Caddy, Dark Brown, 11" x 11"
Esschert Design Square Plant Caddy, Aged Brown, 11" x 11"
Gardman Plant Caddy, Green, 13" dia.